This is the fourth part of Robert Nicholl's memoirs of the London Mod scene which he is kindly sharing with other aged Mods (like himself) or younger people who find Mod styles interesting. The first part of his story can be found here. "Before we ventured into the West End, me and my mates started visiting clubs in the North London area and these provided an early introduction to Mod culture. The Royal Dance Palace in Edmonton was a favorite but with its dress code it was rather formal which could be disconcerting. For the Royal, we’d buy white paper collars in an elevated style worn with studs on standard shirts. The collars looked as immaculate as the best starched collar but had the disadvantage of becoming tattered and falling apart if the exertion of dancing made us sweat a lot. Cravats, often in paisley styles were popular accessories and when we visited less formal local clubs we might wear them with a thin crew-necked sweater, or a regular shirt." Some local dances and clubs were small and cozy like the dances at Broxbourne, others like a jazz club in Edmonton, booked known bands such as Alexis Korner’s Blues Incorporated. Cyril “The Squirrel” Davies switched from guitar to harmonica while with Alexis Korner and in 1962 both Mick Jagger and Art Wood sang with the band. We talked with Cyril Davies after a set. He had few social graces and no sartorial style at all. He wore scruffy trousers and was balding with untidy hair. Art Wood states, “I remember Mick asking Cyril how to bend notes and Cyril just said, ’Get a f .. ing pair of pliers.’ He was nice like that” (Rawlings 2000, p. 40). I was more fortunate and Cyril explained that when playing my Hohner Echo harmonica, rather than simply blowing, I could obtain a whining blue note by sucking in the lower range and squeezing the air flow with my lips. By this means a key of “A” harmonica, for e.g., can be played with the “E” chord of the guitar, commonly used for blues. This conversation must have occurred before October 1962, because at that time Cyril Davis left Blues Incorporated to form his own band. Davies died prematurely on January 7, 1964, aged 32 of a pneumonia-related heart attack. There was a very early Mod club in Waltham Cross just north of London that we started to go to around August 1962. It attracted a lot of early Mods and scooter boys on their Vespas and Lambrettas. This was about six-months before I got my own Vespa GS and was one of my first experiences of seeing Parka-clad scooter riders in a pack, and when the scooters were parked in rows outside the club they were an impressive sight. Unlike later eras, in the mid-sixties there were no laws requiring crash helmets. Although motorcyclists generally wore them (I wore one at sixteen on my BSA 250cc), Mods preferred other headwear or no headwear at all. With the option of the Parka hood if it rained, most went hatless or wore a Bluebeat Hat. Borrowed from the West Indian rude boy look, a Bluebeat Hat is a small porkpie trilby with a tiny brim. In my case, I wore a black beret on the front of my forehead and instead of the standard Parka I wore a short oilskin coat. Recently I discovered that Kenney Jones of the Faces also wore a French beret in the same way when he rode his scooter (Rawlings 2000, p. 125). With no windscreen or merely a tiny one, when riding, Mods adopted a jaunty upright posture, knees were splayed and although the heels were behind the fender the toes were pointed out at 45 degrees, that’s important, no self-respecting Mod would ride in any other way. In the depth of winter I regretted not having a snug Parka, and when I left Pat B’s flat in Holloway for a three or four mile ride north, I wore leggings, mittens, scarves and thick jerseys so finally I was wrapped in globular fashion like the Michelin man. Riding along the tediously straight Cambridge Road I would take my hands off the handlebars and flap my arms across my chest trying to keep warm. Performers at the Waltham Cross club included Gene Vincent, Screaming Lord Sutch, Joe Brown and the Bruvvers, and Bruce Channel with his harmonica player Delbert McClinton (“Hey Baby” 1962). Joe Brown was a chirpy cockney with a flaxen brush of a hairstyle who could play a mean R&B guitar. He sang a very good live version of the Coaster’s “I’m a Hog for You Baby” but he never recorded it. In 1960 he had recorded “The Darktown Strutters Ball" which showcased his guitar. However, his specialty became upbeat versions of old musical hall songs such as “Jellied Eels” and "I'm Henry the Eighth" and he eventually became a pop star in his own right. Although later, music came to symbolize different rival groups, in the later 1950s – early 1960s, there was a smooth transition between Rock-and-Roll and Rhythm-and-Blues. Even as Mods we would get a kick from Presley’s early “Mystery Train,” or “That’s Alright.” Nor at that time was there much of a rift in North London between Teddy Boys and Mods, for example my move from one to the othe r was a smooth evolution. Teddy Boys were dying out in London anyway. Although Gene Vincent is the epitome of Rock ‘n’ Roll and Lord Sutch was pretty much a Rock ‘n’ Roller, to the extent that they were good entertainers we enjoyed their music, after all there weren’t any performers that looked like us at that time, remembering that the Beatles didn’t release their first single “Love Me Do” until October 5, 1962. I first saw a particular dance at the Waltham Cross club that I’ve subsequently seen in old American “beach party” type films. It has a name, what is it? The body is stiff and leans slightly forward while the arms hang loosely and rhythmically follow the torso as it pivots from side-to-side, while first one knee bobs several times in time to the beat and then the other. The first bloke I saw dance it adopted an inane look on his face, his tongue may even have lolled out the corner of his mouth, as he went through the side-to-side movements. We thought, “Is he serious?” But it caught on—I did it, we all did it, it became a dance fad for a number of weeks. In Wood Green, St. Stephens Hall provided another popular weekly dance event where scooters could be seen parked in lines in 1963. It catered for Mods from Palmers Green and Wood Green especially the girls who were not as mobile as their male counterparts. As a result, songs by girl groups such as the Chiffons were popular and I particularly remember Phil Spector’s songs “Dah Doo Ron Ron” and “Then He Kissed Me,” by the Crystals, and “Baby I Love You,” and “Be My Little Baby” by the Ronettes. Wolsey Hall in Cheshunt, Hertfordshire, was another venue north of London that attracted Mods. It served as a club a couple of times a week from 8:00 pm– 11:00 pm and The Who played there regularly in late 1964 and early 1965. I have confirmed that The Who were booked on 19 October and 18 November 1964, and on 13 January 1965, but they performed at Wosley Hall at other times, and me and my mates attended nearly all of their shows. It was a treat that we wouldn’t want to miss. It was a large hall and was not very crowded, so we were able to get close to the stage. Sometimes we went further afield in cars, to the Top Rank in Stevenage, Herts, or a similar Mecca in Basildon, Essex, where the Dave Clark Five played. Minis and minivans were available but larger family cars were used if possible because they made better dressing rooms. As an example of how fastidious we were and how we were determined to arrive unrumpled we’d wear casual clothes for most of the journey, but as we approached the place we’d change into our jackets, trousers and shirts that we had on coat hangers, as we drove along. I wish I had a counterpart, a Mod girl who could remember the early-mid sixties and whose female perspectives on fashions, hairstyles, and make-up would be enlightening. As it is, though spotting Mods in the RSG tapings helps, I have to rely on my own imperfect memories. Early hairstyles of Mod girls evolved from the bouffant and flick-ups of the earlier era, and a small backcombed bouffant remained but with shorter fringed edges and at the front a parting in the middle or just to the side. Of the girls I socialized with at the Waltham Cross club at the end of 1962, I remember Linda C. best, she was a Cheshunt girl whose Modernist elegance was appealing. Her dark hair was styled in a bobbed bouffant, with a long bang on one side swept back and held in place behind her ear with an ornamental hair clip. In her tight navy blue cardigan, white blouse, and calf-length skirt flared a little at the hem, she was not so much pretty as stylish. Mod fashions generally had a unisex look and as time went by Mod girls’ hairstyles became shorter and were similar to those of the boys with soft sideburns in front of the ear and a layered style, slightly cropped on top. Suede shoes, mostly Hush Puppies, were worn by both males and females but were particularly popular with the girls. Slim-fitting clothes were the norm for girls and many Mod girls wore boxy-shaped jackets and calf-length straight skirts while others took to wearing slim three-quarter length suede coats which could be worn with either slacks (parallels) or skirts. Mod girls were assertive and forthright. There was strong sense of fellow-feeling and they supported one another. They were not dependent on, but rather equal participants with the boys. It is a fact that the Mod idiom generated a tribal mentality and Mod girls were normally seen in clusters, seldom alone, instead they’d be with a friend or two or more. Mod girls displayed a boyish image which downplayed their femininity and, depending on the individual, they could look quite drab. However, the heavy make-up that Mod girls used to darken their eyes helped to emphasize the difference between the sexes. For a while, cheap lightweight plastic or nylon macs from C&As were popular, normally in a dull blue. They were good for the blokes because they could wear them over their suits on the scooters, but for the girls they became like a uniform. Riding along Green Lanes, the high road from Wood Green to Harringay, you’d see clusters of look-alike tomboys in their dark blue macs; but they were alright and real Mod aficionados. 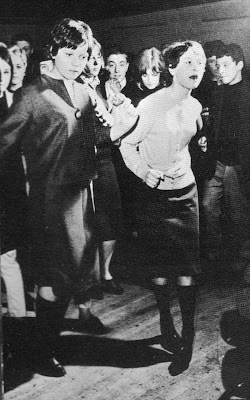 We not only met girls at clubs, but the various London colleges held dances where we could meet a nice class of girl, and some pursued Mod fashions. I have already commented that I was favorably impressed by girls I met at The Scene such as Pat B, Bunty W, and Elaine B, but unfortunately as time went by the tone of the Scene went down. I’m reluctant to wrap up this discussion of Mod girls on a negative note but the truth is that, whereas in the early days the patrons of The Scene were from a mixture of social backgrounds, later, Mods from the inner-city began to predominate and there was a noticable drop in moral standards. I attended parties where some girls freely gave themselves to more than one boy during the course of the evening. 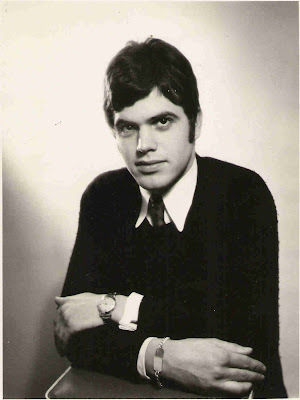 Photo 1: Portrait taken in 1964. 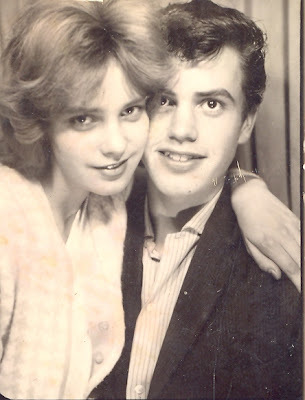 Photo 3: 1960, Me as a sixteen year old Teddy Boy with girlfriend Pat S. at the Kurzal in Southend. 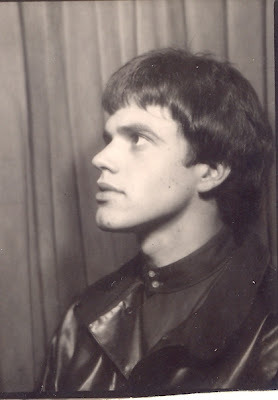 The end of my relationship with Pat around August 1962 precipitated my change of style and my becoming a Mod. Rob is also interested in publishing his memoirs and would like to hear from anyone with any advice or with an interest in publishing them.